Traylor (ca. 1853–1949) was an American artist that started drawing and painting in his 80s when he was homeless. He had lived his entire life in the South, born into slavery and witness to the Civil War, Reconstruction, and Jim Crow-era segregation. Traylor drew while sitting on street corners, using scraps of cardboard and paper waste with whatever drawing supplies he could find—stubs of pencil, crayon or paint. In 1939, local artists Jay Leavell and Charles Shannon took an interest in Traylor, helping support the artist through buying artworks and supplies. Shannon and his friends called themselves New South artists and had just established a community art gallery and school in Montgomery to create a space for local artists to gather and show their work. 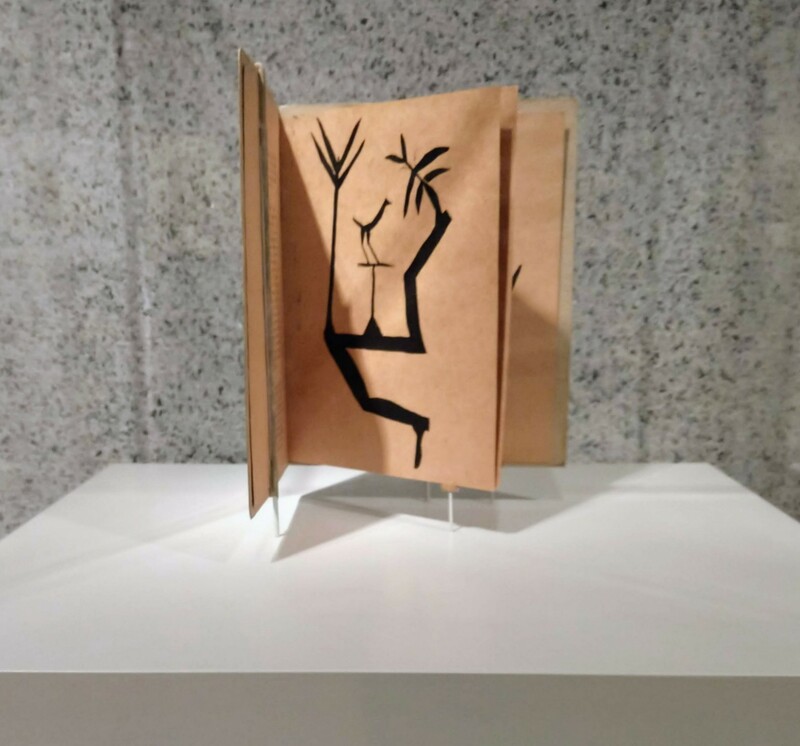 The New South Gallery was the first to display Traylor’s work, in the 1940 exhibition “Bill Traylor: People’s Artist.” The exhibition was on view for nearly 3 weeks, and consisted of more than 80 works on paper, hung unframed in groups along the walls and even over windows. 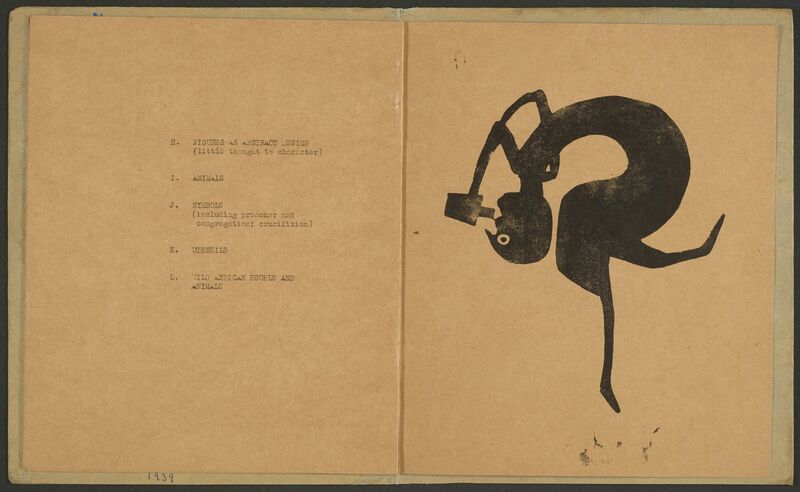 Despite its short run, the 1940 exhibition was accompanied by a small catalog, also titled Bill Traylor: People’s Artist. Shannon wrote the brief text, and Leavell reproduced three of Traylor’s designs as silkscreen prints. Even just these few images give a sense of Traylor’s style and themes: bright colors, flat but active silhouettes of everyday people or animal iconography, and abstract forms. 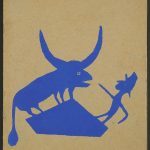 The cardboard cover has an image of a man and bull on a rooftop shape in Traylor’s signature bright blue color, which he found in ordinary poster paint. The catalog also includes images of “Leg Forms with Bird” and “Drinker,” a person bending over backwards to drink out of a jug, both printed in black ink, and a list of the themes in which Traylor’s work hung in the gallery. Bill Traylor: People’s Artist. On view at Smithsonian American Art Museum. In anticipation of the retrospective at the Smithsonian American Art Museum, the Smithsonian American Art and Portrait Gallery Library acquired this rare little catalog in 2017. Very few copies of the catalog exist in private or public collections, and the Smithsonian’s is the only copy held in a library, thanks to the generous donation of avid Traylor collector Joseph H. Wilkinson and his family. 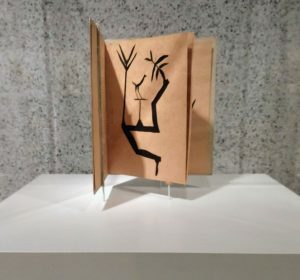 Visitors can see this work, along with more than 150 artworks by Traylor, in the retrospective and catalog of Between Worlds: The Art of Bill Traylor at the Smithsonian American Art Museum, Sept. 28, 2018 – Mar. 17, 2019. Umberger, Leslie. 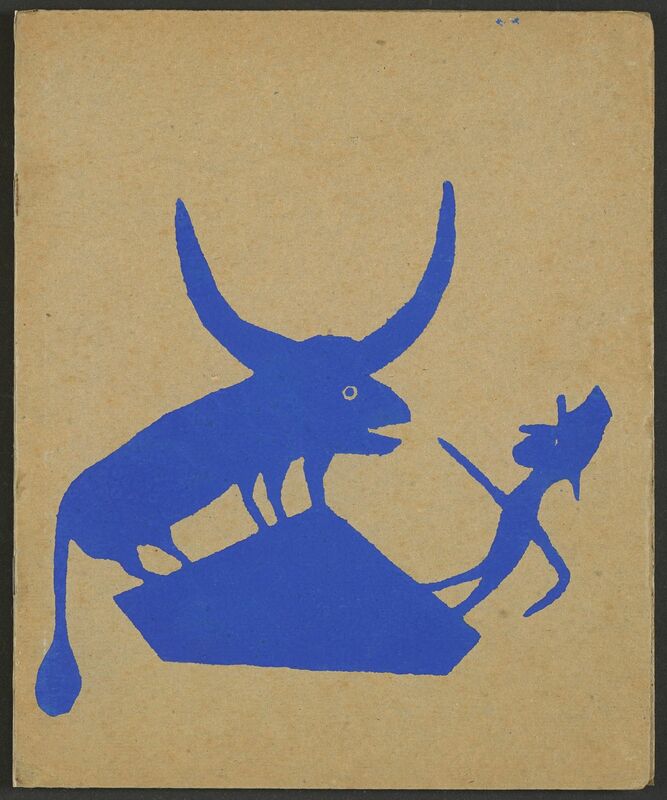 Between Worlds: the Art of Bill Traylor. Washington D.C.: Smithsonian American Art Museum, 2018.